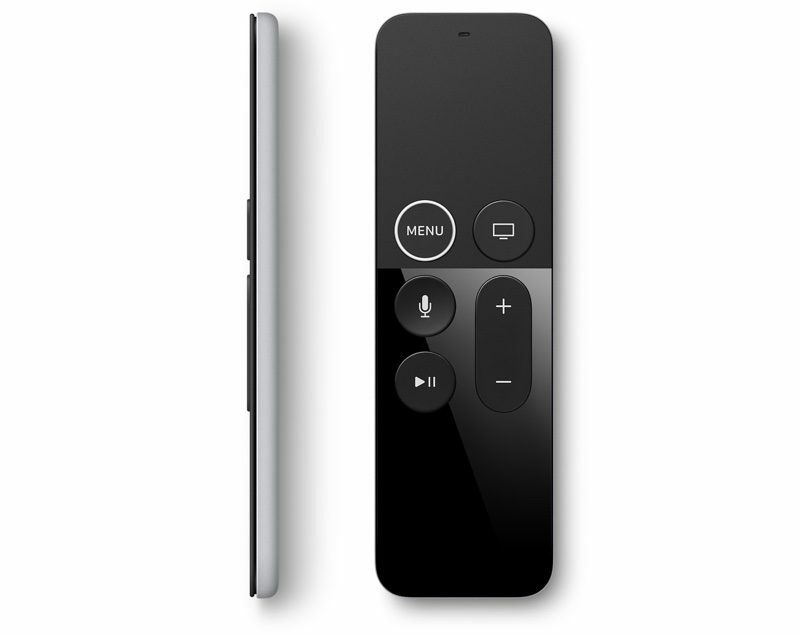 Aside from the redesign to the Menu button, the new Apple TV Siri Remote appears to be identical to the previous-generation model. At $59, the remote is $20 cheaper than the previous-generation Siri Remote. Ahead of the launch of the new Apple TV, there was code found in leaked golden master software that suggested the new remote would feature new haptic feedback capabilities, but there's no mention of haptic feedback functionality in the description of the device. The revamped Remote continues to ship with a Lightning to USB cable, and it is available with both the new 4K Apple TV and the existing fourth-generation Apple TV. Apple is pricing the 4K Apple TV starting at $179 for a 32GB model. The fourth-generation Apple TV is available for $149. Update: Apple notes in its overview on developing apps for the Apple TV 4K that the new Siri Remote is able to provide apps with data on attitude and rotation rate, in addition to the acceleration and gravity data generated by the original version. Lol. Does the ring glow in the dark? I'm glad it's a little cheaper, but I'd hardly consider adding a white circle around one button "revamped". Well this will at least quite some of the MR complainers about their massive orientation issue. They just couldn’t figure out which way was up lol. No it won't. The remote still has a symmetrical shape, and you aren't going to see the circle in the dark. I hope this is a temporary "what we can do to make the current design a bit better without any effort" change and they're working on an actual revamped model. If this doesn't have the haptic functionality, maybe it'll be in that new design. Apple doubling down on a bad design here. They need to be able to admit when they've made a mistake and correct it. If nothing else, they should have changed the remote so people can figure out which way is up in the dark. This remote, new and last gen, is the worst remote ever. Way too sensitive to touch. Never been able to adjust that away. Surprised the new 4K update didn't come with a completely new remote that had some decent ergonomics compared to the good to look at but painful to use stick of butter we have now. I have to admit that the Siri remote is... meh. We’ve had one for almost a year now and we still can’t really use it without looking at it. Can’t tell you how many times we’ve seen that dumb “here’s what you can say to Siri” screen, or exited to the main menu. As I am sure this will be pointed out hundreds of times, this does not solve the problems of the Siri remote. It does not work as a "no look" interactive device or in the dark, which is how we generally use remotes. Feels like the MBA Suits are back in control after some pretty big embarrassments around the Mac line. Bummer. I don’t have orientation issues. The current Siri button is concave. So I always know which way is up just by feel. What do you mean there is no tactile difference in the buttons? The Siri button is concave. That alone tells me which way to orientate the remote. Perhaps my fingers are simply not as sensitive as yours, but I can't perceive any difference in the feel of the buttons on the current ATV 4 remote.